We live in a world obsessed with profit. Buying, selling, acquiring, spending money in the guise of saving money, manufacturing cheaper products, switching to the cash cow of the digital realm…this is all a part of life. Even when you don’t wish to be part of it, you can’t help it. Our society is just woefully consumerist, touching every part of our day to day. But some of us are fighting back. Not only in the real world, where we stick to second hand products, local seller or even handmade items. We are also taking control in the digital world, creating open source programs and licensing content under creative commons licensing. All under the banner of an open and free internet, and the wonderful things that can be made with it in mind. I am even writing this post on OpenOffice. These projects are a testament to that effort, and show what a little ingenuity can create. Things posted on social networks are a tricky subject when it comes to copyright. Quotes and content are shared all the time, and rarely do we know who started it in the first place. Something that can be a real problem when it comes to misinformation spreading like wildfire on the web. But that doesn’t mean there isn’t valuable content on there, such as on Twitter. The question is whether or not you can openly use a tweet for your own purposes. While I wish I could give you a straight answer, there isn’t one. Tweets and social network content uses are a gray area in a legal world that hasn’t caught up with technology. 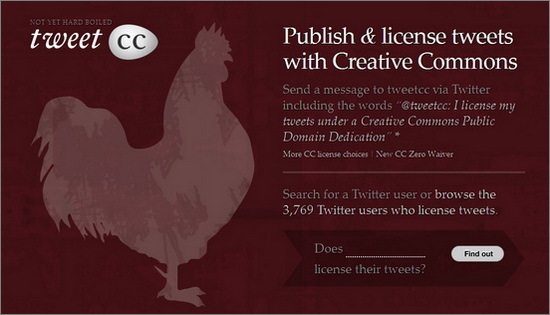 But you can take out the ambiguity by specifying that tweets are offered under creative commons licensing. This site allows you to publish or search tweets with this in mind, and the group of people using it is growing fast. Online video, podcasts and audio files are spreading like crazy these days. But this presents a problem of how to acquire certain sounds without paying a lot of money to license them. Luckily, there are sites out there that have both public domain and user creative, CC licensed audio clips for you to use. My personal favorite is Freesound, which lets you search for sounds, people, speak with others on the forum and upload your own clips for others to use. All entirely free, and in a friendly, helpful environment. You might not think of Flickr as a ‘project’ because it is a major websites owned by Yahoo! Technically, I can see why this would be the case. But their Commons section is a project, and an experiment in free use. Not only has the gallery of CC photos and videos become massive in the last few years, but they have been working on making it even easier to share and directly link to that content from blogs and sites. Even going so far as to make it compatible with sites like Pinterest, which is a very cool step towards an open web. Check out cartoonists that give away their comics for reuse for free! Going on this blog is like being hit in the face with a manic episode. It is all over the place, loud, constantly updated and very busy. Videos, comics, music, articles, opinion columns, science links, book, movie and TV reviews, game tutorials, Left Wing political jargon, podcasts…it is all here. Plus, it is all offered as creative commons, with a ton of free content being shared. The traditional blog format makes it an innovative means of utilizing an old tool. Don’t believe anyone who tells you education is not a basic human right. With colleges and universities becoming overpriced, schools being underfunded and some organizations allowed to select their own curriculum with no basis in facts, it is no wonder education in this country is failing so badly. All over the world there is a new movement afoot, however. This is open source education, providing full classes and a ton of information absolutely free. It has been updated for accuracy, curated and offered at no cost in videos, articles, printable textbooks and more. OER, or Open Educational Resources, is probably the largest network for free education. Part of this movement is to offer products, especially those centered around entertainment and culture, for free. We are seeing this as part of a wider scope of thinking, though there is some confusion about what it means. For example, I have heard some claim that sites like Facebook offer a mainstream view of the Free Product Phenomenon. But anyone who knows how social networks make their money – by selling your personal details to third party advertisers and marketers – know it is not free. A true item given as part of creative commons is one that asks for nothing mandatory from the user. Such as open source programs on the web that might suggest a donation to assist in the development, but don’t make it a requirement for use. Or videos that are posted on sites like YouTube, Blip or Vimeo for open viewing and sharing. In the summer of last year, Wiki Noticia did a fascinating interview with comic book artist Jorge Pinto. He had recently had a book published that was entirely free to read online or print out. Everything was provided under creative commons licensing, as Pinto is a big believer in free culture and open sharing. He is the perfect example of the Free Product Phenomenon in practice. Information is becoming more widely available, and content is now being shared like never before. From photos to videos, and even tangible products, we have some incredible projects going on right now. Some of which have been going strong for years and have big plans for the future. Do you know of any good creative commons projects out there? Heard of or used a good open source product? Let us know in the comments.